Are you ready for this, metal fans?? That’s right, the Prince Of Darkness himself is finally calling his reign of supremacy to an end. 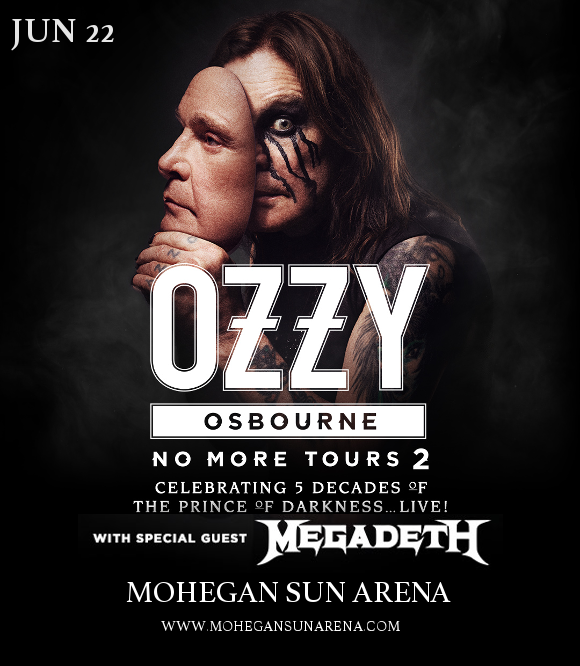 Ozzy Osbourne embarks on the No More Tours 2 tour in 2019 – hitting the Mohegan Sun Arena on Saturday 22nd June 2019 with support from none other than metal heavyweights MEGADETH!! Fans should get their tickets fast, because this time, it really looks like it’s the final tour from the Godfather Of Heavy Metal. Don’t miss out – book your tickets QUICK while you still have the chance! Gaining fame as the in equal parts charismatic and insane frontman of Black Sabbath – credited by many as being the first truly heavy metal band EVER – Ozzy Osbourne changed the face of rock music forever with the band, and from there, went on to establish a successful solo career. With a career that spans in total over four decades, countless sold-out arena tours around the world, and his own touring festival – the Ozzfest – to boot, Ozzy Osbourne has earned the informal title of the Godfather of Heavy Metal. Now, he’s touring for the last time with Megadeth, one of metal’s Big Four and one of hundreds of artists influenced by Ozzy and his work. Make sure you’re there! !